All the transactions that occur within the software will be listed in Transactions. Invoices such as sales, repair payments, layaway payments, bill payments can all be found in Transactions. 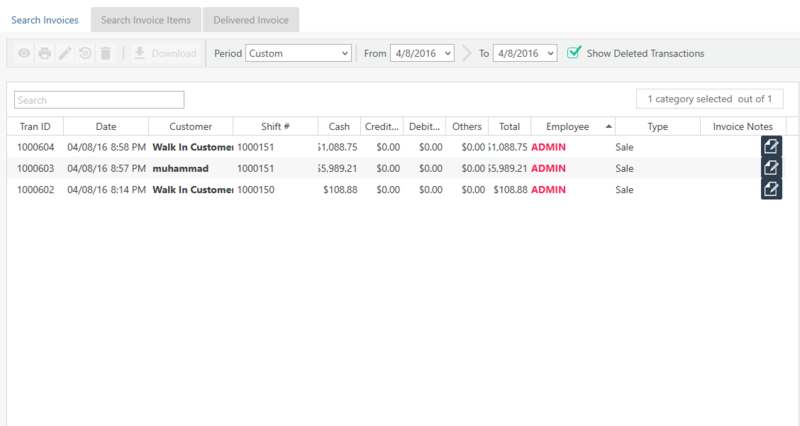 From the Transactions module you are able to view, print, edit, refund, and delete transactions. Right click anywhere in the software and you'll be presented with quick links. From the list of quick links, you may click on the Transaction History quick link. From the list of transactions, you may search a transaction by entering a customer name, transaction , amount, or transaction ID in the search field. Once you find your transaction, select and click on the eye icon from the options menu to view the transaction. Editing any transaction in the current shift will bring the transaction back to the main dashboard for editing purposes. You are able to make any changes necessary and re-checkout the transaction to save the changes. After editing any transaction, the old transaction is marked with a red line indicating that it is no longer present and another transaction is created to save the changes you've made. Note: You are only able to edit transactions that occurred in the current shift. Once you find your transaction, select and click on the Pencil icon from the options menu to edit the transaction. The transaction will be transferred back to the main dashboard and you can edit the transaction. To save the changes you have made, click the checkout window and save the transaction. Refunding a transaction will allow you to refund or exchange an invoice that you created. Note: You can only refund or exchange a transaction if it occurred in the current shift. Once you find your transaction, select and click on this icon from the options menu to refund the transaction. In the refund or exchange window, you may enter a restocking fee in its appropriate field, or change any other information such as refund days, tax amount, total amount and etc. Once you're done making changes, you may click the save button and the transaction will be brought to the main dashboard. If you'vent already entered the customer's name, you may enter it in the customer name field. You may make any other changes to the transaction through the main dashboard. Click the checkout button then click the save button to complete the refund or exchange. Deleting a transaction will mark the transaction with a red line indicating that it is no longer valid. Note: You can only delete transactions that occurred in the current shift. Once you find your transaction, select and click on the Trash bin icon from the options menu to delete the transaction. Enter the reason for why the transaction needs to be deleted in the reason window.